You are on call overnight in the ICU and taking care of Mr. Z, a 78-year-old man who is on noninvasive mechanical ventilation for respiratory failure due to pneumonia. On nighttime rounds, the nurse reported that MR. Z started to pull at his facemask and central line and pick at his sheets. On morning rounds, the team was concerned that Mr. Z was developing ICU delirium. He demonstrated some confusion and inattention on a bedside Confusion Assessment Method evaluation, but he was active and engaged during the day when his family was visiting. After his family members leave for the night, you wonder how to keep Mr. Z safe in the ICU. You know that antipsychotics such as haloperidol are commonly used to treat ICU delirium, despite limited evidence of benefit, but what is the evidence for pharmacological treatment in this setting? 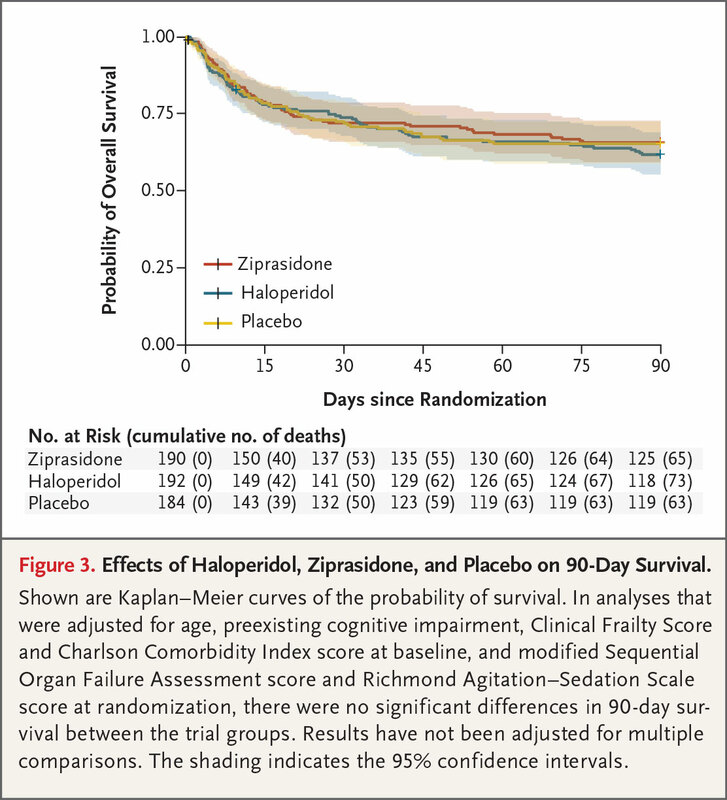 In a randomized, placebo-controlled trial published in NEJM in December 2018, Girard and colleagues compared the efficacy of two antipsychotic medications —haloperidol and ziprasidone — with placebo for treatment of both hypo- and hyperactive delirium in the ICU. Patients in acute respiratory failure or shock who developed delirium received intravenous haloperidol, ziprasidone, or placebo for as long as14 days. The starting dose for haloperidol was 2.5 mg in patients younger than 70 years and 1.25 mg in patients aged 70 and older, with a maximum dose of 20 mg daily. The starting dose for ziprasidone was 5 mg and 2.5 mg, respectively, with a maximum dose of 40 mg per day. The primary endpoint was the number of days alive without delirium or coma during the intervention period. Among 1183 patients enrolled, 566 (48%) developed delirium (89% hypoactive) during the first week of their ICU stay and were randomly assigned to one of the three treatment groups. No significant differences were found among the three groups in the primary outcome, the duration of delirium (defined as number of days without delirium or coma over 14 days) or other secondary measures such as length of stay, duration of mechanical ventilation, and 30 or 90-day mortality. A concern in the ICU is the widespread use of consciousness-altering medications, such as opioids and sedatives, that likely contribute to delirium. Not surprisingly, about 90% of patients in the trial received one or more doses of analgesics or sedatives. However, this study also found no reduction in the concurrent use of opioids or sedatives in any of the three groups. So, what should you do in the ICU when faced with a patient like Mr. Z who is starting to show signs of delirium? Based on this study, we cannot confidently treat delirium in critically ill patients with antipsychotics nor regard the medications as ineffective. What we should do prior to using medications is maximize nonpharmacological strategies — such as reorientation by staff and family members, maintaining day-night cycles, and minimizing the use of sedatives — to prevent and treat delirium in ICU patients. Angela Castellanos is a general pediatrician and editorial fellow at the NEJM.